Hancock Mountain is a 4,380 foot mountain in the Pemigewasset Wilderness area of the White Mountains between Franconia Notch and Crawford Notch. The mountain is named after John Hancock, one of the Founding Fathers of the United States. 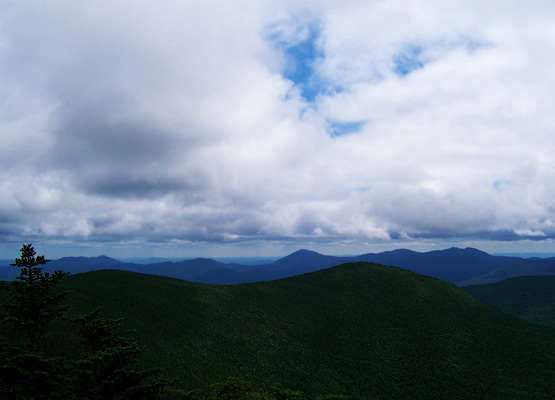 The mountain used to be the most remote and inaccessible peak in the White Mountains, before the Kancamagus Highway was finished. 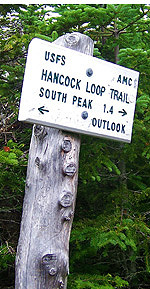 Today, the trail begins on the well known hairpin turn on the Kancamagus Highway at the Hancock Overlook Parking area. South Hancock Mountain is only 1.4 miles away from Hancock Mountain and is a loop hike, so many people choose to hike both peaks in one hike. To hike both mountains from the Hancock Overlook Parking Area, is 9.8 miles. South Hancock Mountain is a 4,278 foot mountain in the Pemigewasset Wilderness area of the White Mountains between Franconia Notch and Crawford Notch. The mountain is named after John Hancock, one of the Founding Fathers of the United States. The mountain used to be the most remote and inaccessible peak in the White Mountains, before the Kancamagus Highway was finished. Today, the trail begins on the well known hairpin turn on the Kancamagus Highway at the Hancock Overlook Parking area. Hancock Mountain (North Peak) is only 1.4 miles away from South Hancock Mountain and is a loop hike, so many people choose to hike both peaks in one hike. To hike both mountains from the Hancock Overlook Parking Area, is 9.8 miles. 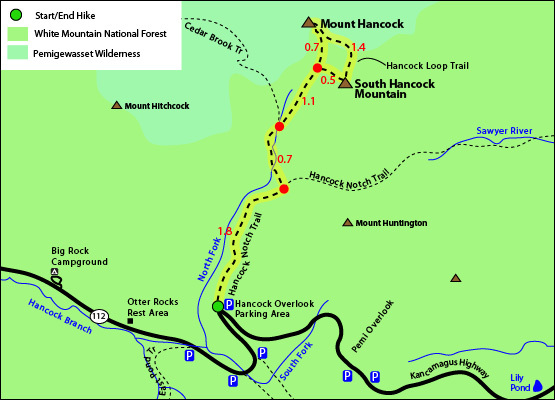 The map below shows how to get to the summit of Hancock Mountain, as well as South Hancock Mountain. This is a semi-loop hike (see map below) starting at the Hancock Overlook off the Kancamagus Highway in Lincoln, NH. The trail starts on the farthest end of the parking lot. You will go down a little hill, then cross the highway to begin the trail. Hike on the Hancock Notch Trail for 1.8 miles. Turn left at the junction and continue for 0.7 miles towards the Hancock Loop Trail. Continue for another 1.1 miles after bearing right at the junction. At the next junction, go left for 0.7 miles until you reach the summit of Hancock Mountain. 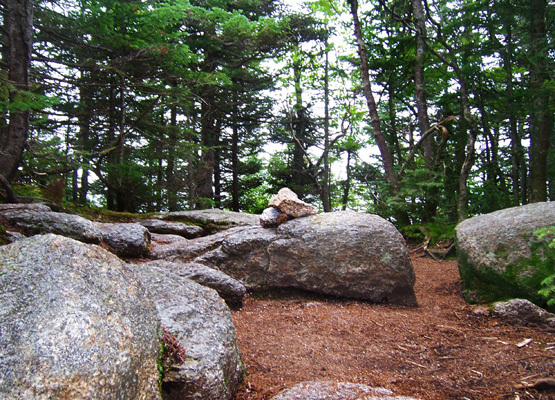 To get to South Hancock Mountain, continue on the Hancock Loop Trail for 1.4 miles. To begin the descent, head down for 2.3 miles (the first 0.5 miles are very steep, be careful). When you reach the junction for the Hancock Notch Trail, turn left, and hike back to the parking lot, 1.8 miles. Views from Hancock Mountain, North Peak, on August 13, 2011. Summit of South Hancock Mountain on August 13, 2011. The parking lot for this hike is right on the tip of the famous hairpin turn on the Kancamagus Highway/112. The parking lot is called the Hancock Overlook. From I-93, take exit 32 towards North Woodstock/Lincoln, NH. Turn left onto the Kancamagus Highway/112 East, and continue for 10.5 miles until you reach the parking lot.